The word Aztlan is about Mexicans forming their own country within our country and taking back lands from us that they deem stolen, bottom line. Certainly you aren't denying this? They are of the Hispanic culture, that's all. I never said that all Mexicans are advocates of reconquista (or any other national group) but the group in this posted topic is. If you can't see that from their own words then I don't know what else to tell you. Can you show me something that explains the definition of Aztlan? Just because they decided to name themselves that doesn't mean that's the definition of the word. And fyi: there is no "hispanic culture." The only thing each nationality has in common with the other is the language. It's the same thing as there is no universal "european" culture, they are all different. So now the argument is "some mexicans are probably racist, therefore it's cool if I'm racist"??? [LEFT]The official national symbol of MEChA is an eagle holding a machete-like weapon and a stick of dynamite. 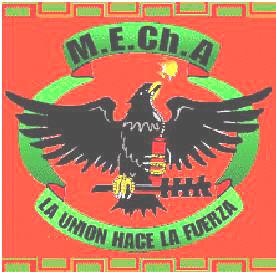 The acronym MEChA stands for "Movimiento Estudiantil Chicano de Aztlan." or "Chicano Student Movement of Aztlan." Nasty people who need to be dealt with by LE. That stuff scares ME cause I aint brown enough to look Mexican. Tell THAT to Chicanos, especialy La Raza who DONT speak Spanish. "Aztlan" is the explanation they make for why they have a racial right to break our laws. Our immigration laws cannot apply to anyone from Mexico or Central America because according to the Aztlan myth, the Aztecs once ruled over the entire North American continent until some English speaking people took it away from them. Aztecs ruled over the Comanches, the Navaho and the Iroquois. Aztlan means people whose ancestors always lived in Chiapas now have every right to move to Chicago or New York and are not obliged to obtain work visas. Never mind that the Aztecs ruled over only about a 35 mile radius near Mexico City and that no Aztec ever wandered north of the Rio Grande. A lot of "hispanics" don't speak Spanish, nor did their parents. In fact some "hispanics" still speak a Mayan dialect, and some "hispanics" can only speak English. And in northern Mexico, there are people who speak German, but as citizens of Mexico would have to be "hispanics". It's not language. But you're right, it's not culture either. So it's a big deal because they're hispanic?